In May, 2016, Roberto Saviano, an expert on the workings of the mafia, stated that “Britain is the most corrupt country in the world.” Given that the Western media tend to categorize the issue of corruption along geopolitical and racial lines, one would find it difficult to arrive at such a conclusion after having analysed a mainstream broadcaster like the BBC. Thus, on an edition of last August’s BBC HARDtalk programme, host Stephen Sackur interrogated Nigeria’s Minister for Power, Works and Housing, Babatunde Fashola in a way that he wouldn’t had he interviewed a UK minister. During the discussion Sackur repeatedly implied that the Nigerian government was systematically corrupt. At one point the BBC presenter related an ‘off mic’ incident that involved the Nigerian minister and the then UK PM David Cameron. The latter was said to have berated Nigeria after having described the country as one of the two most corrupt countries in the world. The irony of Cameron’s comment would unlikely have gone unnoticed by Fashola. 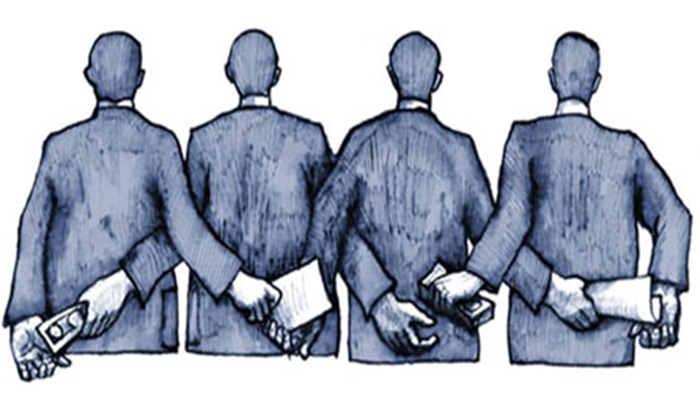 In 2010 the UK government passed into law the Bribery Act. Big business in the UK have repeatedly lobbied against this legislation, thereby undermining all attempts at preventing corruption. The potential impact of the legislation is likely to be felt primarily, but not exclusively by, businesses. Why? Because bribery and corruption is an inherent part of big business deal-making. The notion that the British establishment occupies the moral high ground on matters of corruption is laughable. Instead, viewers to the BBC were conveniently invited to vent their anger towards a black politician in a far away country. In 2013, Cameron visited one of the most corrupt and authoritarian countries on the planet, Kazakhstan. Its leader showered him with gratitude and praise. Kazakhstan’s former police chief is linked to the ownership of £147m-worth of London properties which forms part of the UKs status as a safe haven for corrupt capital. This represents the tip of a huge ice-berg of corruption in Britain. Readers might, for example, recall the Straw and Rifkind affair, the MPs expenses fiasco, the on-going PFI saga that’s crippling the NHS, the long-running HSBC scandal and establishments complicit role in the Panama Papers and Paradise Papers. In addition, the UK government is actively involved in the selling of armaments to the Saudi regime who are raining them down on the Yemeni people. A great deal of the trade in weapons of death takes place at the bi-annual international arms jamboree in London’s Docklands (of which UK royalty is, historically complicit). The point that Jenkins makes, namely that lobbying and corruption form a seamless whole, is a very good one. The widespread perception that Britain ranks 14th among the most corrupt countries in the world, is clearly indicative of the way in which the media misinform the public by ignoring the fact that corruption is embedded in the heart of the British establishment. In bringing together a wide range of leading commentators and campaigners, David Whyte shows that it is no longer tenable to assume that corruption is something that happens elsewhere. Indeed, as Penny Green of Queen Mary University of London, contends, “the network of egregious state and corporate corruption in Britain rivals any in the developing world”. This is no accident. The function of the state has shifted from that of ‘direct provider’ to ‘pro-business facilitator’. The ideology that came to embody this change is neoliberalism. Rather than goods and services being administered democratically, the trend has increasingly been for the state to act as a purchaser of these services which have then been provided privately and indirectly. As each separate financial intermediary takes their slice of the financial pie, the temptation for corrupt practices becomes greater and the concentration of capital and deregulation of labour markets more acute. With the balance of economic power tilted increasingly towards the rich who are able to buy the influence of politician’s, the impact on democracy has been devastating for millions of ordinary people. A hollowed-out system is one in which the 99 per cent increasingly find it difficult to establish some personal and meaningful pattern in a social world dominated by huge and distant monoliths whose power over the livelihood of billions seems absolute.